A grim topic, and not one that we like to think about. Often wastewater is out of sight, therefore out of mind. making dealing with your wastewater pipes not the highest of priorities. However, it should be and often there is confusion around who is responsible for what sewage pipes. To help, UKDN Waterflow have put together this guide to help put your minds at ease and help you determine what you are responsible for. On the illustration below you will notice 3 coloured pipes and a dashed line. 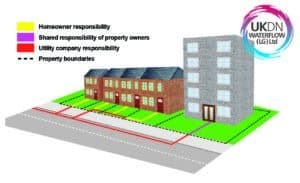 The yellow line is the responsibility of the homeowner, the pink line is covered by shared property owners and the red line is the responsibility of the utility company and finally the dashed line symbolises the property boundaries. An illustration to demonstrate wastewater responsibility. The homeowner is only responsible for the drainage up to their property boundary. If the drainage is shared with a neighbouring property this would be the responsibility of the local utility company from the point it becomes shared. 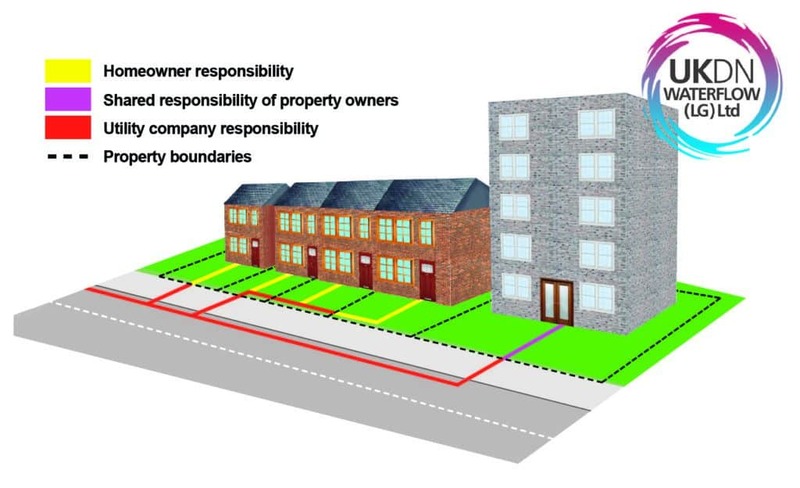 Where there is multiple dwellings within a single curtilage (such as a block of flats) the shared drainage is the shared responsibility of all property owners. The utility company is responsible for drainage that is shared by more more than one property and for drainage outside the property boundaries. For more information please call us on 0333 344 2937. Could the problem be covered by the terms of my insurance policy? If your insurer appointed UKDN Waterflow to deal with the claim, then we will be able to establish if the problem is covered under the terms of your policy. If we need to refer it for a policy decision from your insurer then we would do so and keep you informed of the present position. What if the repair costs are not covered by my insurance company? UKDN Waterflow will provide you with a quotation for the repairs at preferential rates. UKDN Waterflow would be delighted to assist you with the repair work and can still offer a quick and efficient resolution to the problem. What do I do if I think the pipework is the responsibility of the utility company? If you think that the pipe is responsibility of the utility company and a shared line, then call the utility company direct. They will send out a team to investigate and clear the blockage.